The Chicago Region includes all counties within a 75-mile radius of downtown Chicago and covers parts of Wisconsin, Illinois, Indiana and Michigan. 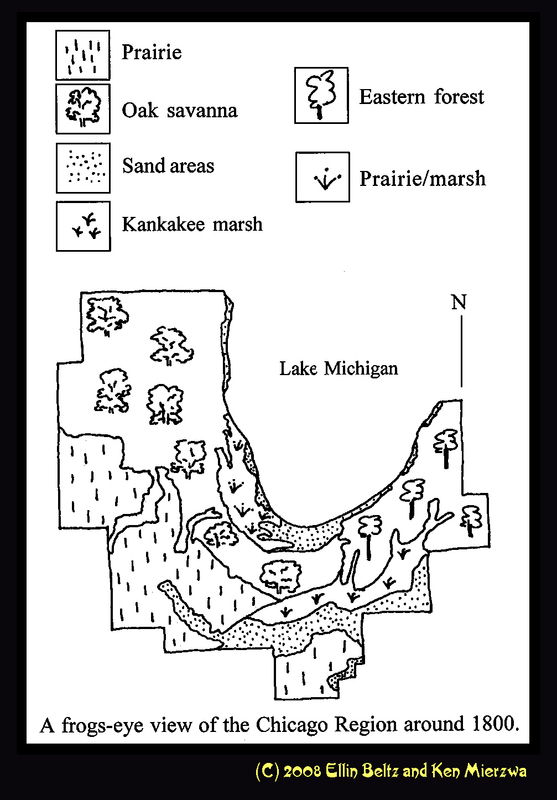 Before 1800, the region was a highly diverse series of environments including prairie, oak savanna, sand areas, eastern forest, and marshes like those on the lake plain and near the Kankakee River. Each habitat type supported particular groups of amphibians at different times in its formation. This "snapshot in time" is of approximately the early 1800s. A similar map could be made today, however, much of the area has been urbanized and developed. Understanding the relationship between frogs and their environment reveals a fascinating story of the changes in the Chicago Region over the past 10,000 years. By about 13,000 years before the present, glacial ice which formerly covered the region had retreated. The environment then was a wild place. Giant lakes and huge floods helped sculpt the features left behind by the glacier while plants and animals attempted to gain a toehold in the rapidly changing environment. When the first frog returned to the region is not known, but we do know that they migrated northwards from unglaciated areas, called "refugia," in the southern and southwestern U.S. and northern Mexico. With one tiny hop from each frog, frogkind marched thousands of miles, crossed mighty rivers and barren lands, finally becoming part of our native fauna. Some species more typical of the American Southwest arrived about 5,000 years ago when a general warming trend encouraged migration of species usually found on the Great Plains. When the weather again turned colder, some southwestern immigrants lingered in the sand areas. The growth and development of the eastern forest provided habitats for frogs which needed less heat and more shade than those of the open sand areas. A once giant meltway from a glacial surge and a former central feature of the landscape, the Kankakee Marsh, is now mostly drained and channelized. It once was a winding wetland, and provided habitat for a whole assemblage of animals from bug to bird; mostly now in agriculture or being paved over for ever increasing suburbia. Along the shoreline of Lake Michigan are a series of parallel ridges; some are natural sand dunes, others are manmade such as the highways 90/94 and I-80. In the earliest days of settlement there was no easy way around the bottom of the lake. The whole area was dune and swale environment, with tiny wetlands separated from each other by raised sand dunes. The Chicago Lake plain had beach ridges (look toward Lake Michigan along Addison Avenue at Wrigley Field), but it was also more dissected by small streamlets and ponds before being converted to agriculture and urbanized. Frogs and toads are creatures of habitat - they are confined by their specialized needs to certain moisture gradients and landscape types. Click on the frog names to go to species accounts.